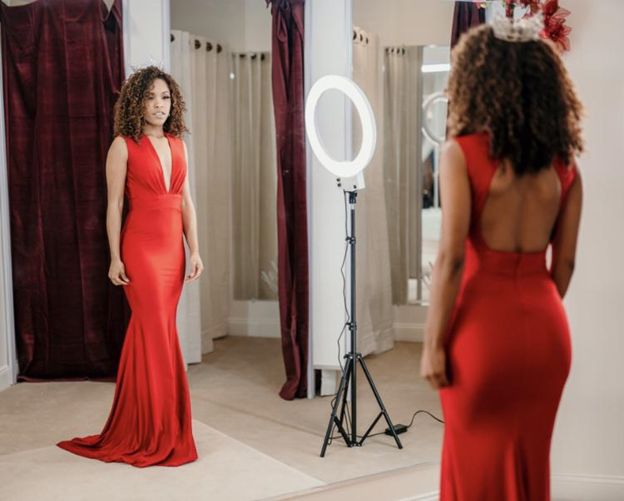 At Lady Black Tie, we want you to wear a unique gown for your special occasion; one that suits your sense of style and personality. We carry one particular collection in our store in which the gowns can be made to your specifications. We have 15 varying cuts & sample styles in store, in sizes ranging from XS-XL. The price on these gowns range from $350-$410. Choose from a color swatch of over 80 colors. We carry 25 of the most popular colors in store on our varying styles, ready for you to try on and see how they work for your complexion. Any gown from this line can be ordered with or without a leg slit. There are two options you can choose for your train, one with a horsehair hem finish and one without. This line is made in the USA, so the turn-around time for your special order is shorter than typical industry standard. As a policy, Lady Black Tie only accepts special orders for these gowns with a customer wear date more than 30 days away. Come visit us in Andover to find your unique style, we look forward to helping you find the gown that is perfect for your occasion.